it is pretty difficult to clearly identify which statements fit in each of the three strands - you may well not agree with my categorisations. This reflects fuzziness about definitions of computer science, IT and digital literacy. Indeed the drafting group was unable to agree definitions of these terms and originally agreed to use the terms Foundations, Applications and Implications instead - it is such a pity that they didn't stick with that. there doesn't seem to be much IT (except at Key Stage 3) - I tend to think that is no bad thing. 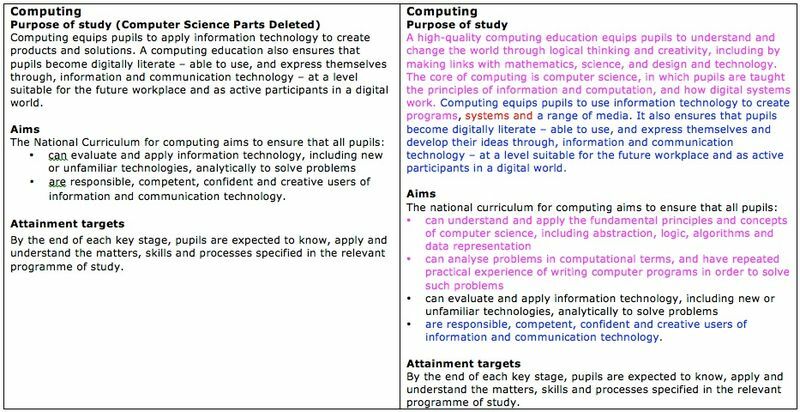 whilst there is an imbalance towards computer science at Key Stage 3, the other Key Stages have a pretty even weighting between computer science and digital literacy (including e-safety). Thus this analysis paints a rather different picture to some of the earlier analysis (by me and others) and counteracts the general impression that many people seem to have that the new PoS is all about programming. This is great news for those of us who think that whilst computer science is important, digital literacy is much more so. In the left hand column in the tables below I have provided an analysis of the Computing PoS that I was given by Richard French from the BCS, which he said Bill Mitchell had produced to show which bits of the PoS were NOT computer science. I think the draft that was being used is probably the one that was put out for consultation. In the right hand column is my analysis of the latest version of the Computing PoS (8-July-2013) which tries to identify the three strands which supposedly make up Computing (i.e. computer science, IT, and digital literacy). You could easily argue that the fourth bullet fits into digital literacy, though I think you could also put it under IT. I don't think there is an IT in KS1. I wasn't sure about the fourth bullet, but tend towards thinking of it as being part of IT rather than digital literacy. 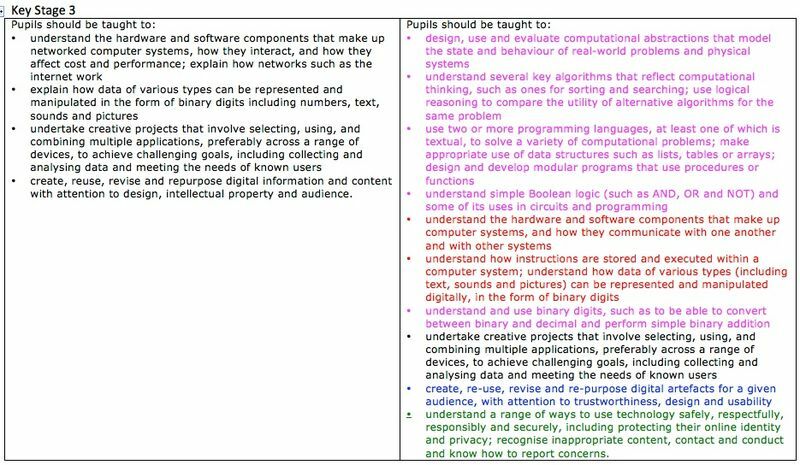 I think that the text in black in the right hand column could be part of digital literacy, but it could also be part of IT. This page was last modified on 10 July 2013, at 17:50.